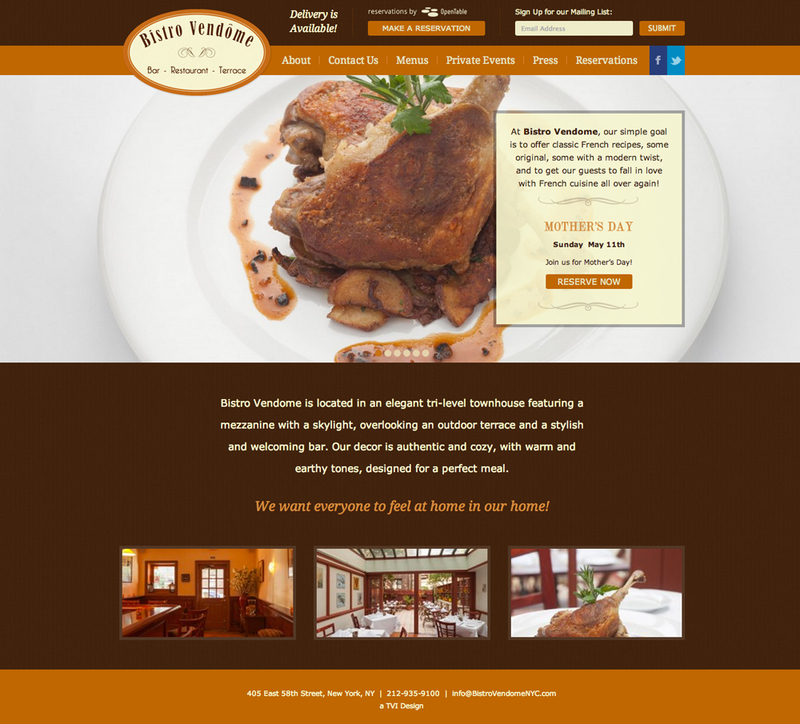 Bistro Vendome has been a TVI client since the restaurant opened in 2010. We created their first website when Flash was all the rage, so it was time for an update. The new design has a warm and welcoming look and feel to mimic the atmosphere of the restaurant which is set in a tri-level townhouse. By moving away from Flash, users have much more access to the information they are seeking. Online ordering and delivery services are easy to find in the improved navigation which drive customers to use these services. Special events and holiday menus are now featured on the homepage to inform users as soon as they enter the site. Menus are not only easy for the customer to browse, but also easy for the client to update. The new website was built with a content management system which allows the client to quickly take care of any web updates. Mobile customers are no longer left out with the included mobile page. From here they can see the hours, view the menu and make reservations.